Adriana Diaz Mireles is on a mission. Inspired by coursework on human rights, the UC Merced senior is intent on pursuing a career in humanitarian advocacy. But first, she’s working to make a name for herself before graduating. 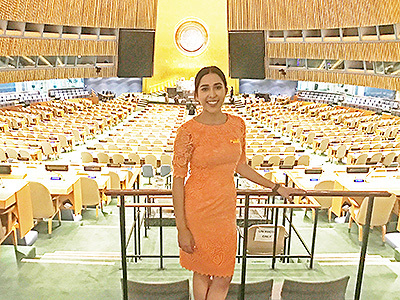 This summer, Diaz Mireles traveled to New York to participate in the University of Pennsylvania Law School’s Global Institute for Human Rights. The weeklong conference — centered on the themes of refugee rights, women’s rights and human rights and business — provided Diaz Mireles the opportunity to convene with scholars, attorneys, United Nations officials and fellow students who share her philanthropic spirit. Over a dozen experts in the field of global human rights spoke at this year’s event. Still, Diaz Mireles felt a particular affinity for the efforts of Antonio Cisneros de Alencar, human rights officer and gender and women’s rights adviser for the Office of the United Nations High Commissioner for Human Rights. This isn’t the first time Diaz Mireles has ventured far afield to engage in advocacy. She previously worked for the Department of Protection at the Consulate of Mexico in Little Rock, Arkansas. She also gained experience in international development while interning at Humanity Africa, a London-based non-governmental organization that seeks to eradicate hunger and poverty in Africa through sustainable farming. And Diaz Mireles has no plans to slow down. Diaz Mireles is quick to credit UC Merced for encouraging her efforts. While applying for this year’s summer institute, her professors provided constant feedback throughout the application process. And the Center for Career and Professional Advancement provided a grant to finance her travel. “Without the support of UC Merced, I wouldn’t have been able to attend such an exceptional program,” she said. After she graduates with her degree in political science, Diaz Mireles plans to pursue a master’s in either Latin American studies or human rights. She doesn’t plan to stop there, though — she also wants to attend law school.